The first thing to do to marry a Japanese national is to get hold of the Legal Capacity to Contract Marriage or LCCM. While to enter Japan as a resident, you need to apply for the Certificate of Eligibility in Japan. You’re on the right track if you’re here to know the application for the Certificate of Eligibility in Japan. Application for the COE in Japan for Status of Residence is a certificate when inviting someone from overseas and want them to stay for a long period of time. As far as I know, the Certificate of Eligibility is the most important and challenging document that a Filipino spouse must acquire to be a resident in Japan because there are many things to consider before the Bureau of Immigration in Japan grants you one. a non Japanese spouse to live together (I belong in this category). My husband is in Cebu Philippines for over four years now. It means, he hasn’t paid taxes in Japan for this period of time. As tax plays a big role in this certificate, we asked assistance from an attorney or a scrivener. My husband doesn’t have a Juminhyou because he’s been living in the Philippines for over four years so the lawyer advised us to give three photos and contract of our apartment. History of our relationship. To prove that our marriage isn’t fake, we submitted a report that includes everything from the time we first met until recently. Additional proofs such as my husband’s English online data screenshot because that’s how we first met, photos of our travels and photos with our families. The requirements might differ a bit from yours, so please refer to this Bureau of Immigration site for the standard requirements. You should submit at the regional immigration office in charge of applicant’s intended address. My husband is from Nagasaki. 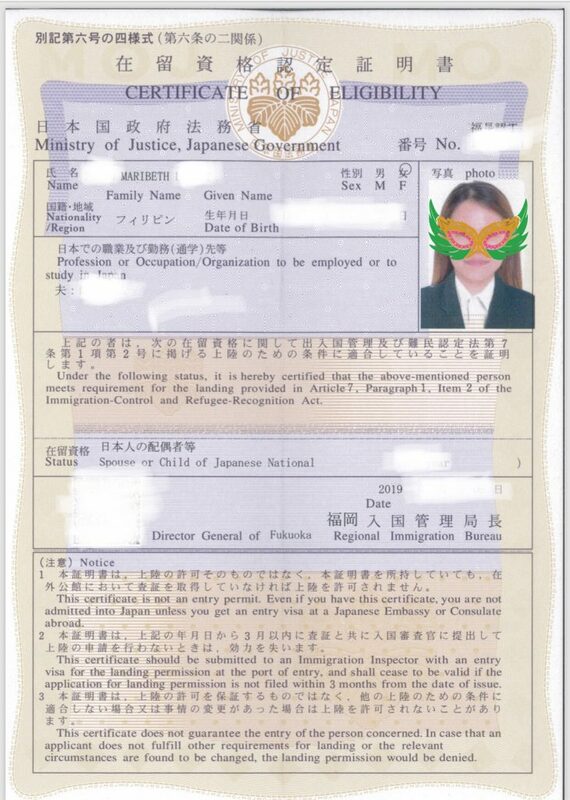 Hence, our lawyer submitted the application in Fukuoka Regional Immigration Bureau Nagasaki Branch. When should you submit the application for the Certificate of Eligibility in Japan? Applicant should submit necessary documents in advance so that the applicant may receive the certificate before entering Japan. Let’s take our case as an example. We submitted it on the first week of December 2018 since we planned of going to Japan in the middle of the year 2019. The standard procedure duration is a month to three months. But it depends. It may come earlier. As for us, we only waited for three weeks before we were granted the COE. We were elated when we found out about the success of our application. However, it’s just the beginning. Procedures in the Philippines are waiting. The next postswill be all about them. Feel free to send me messages for inquiries. Good luck on your application! Allow me to share this quote about faith. This serves as a weapon while waiting for your documents. Was this Post helpful? Yes No 2 of 2 people say this Post is helpful. Hello! 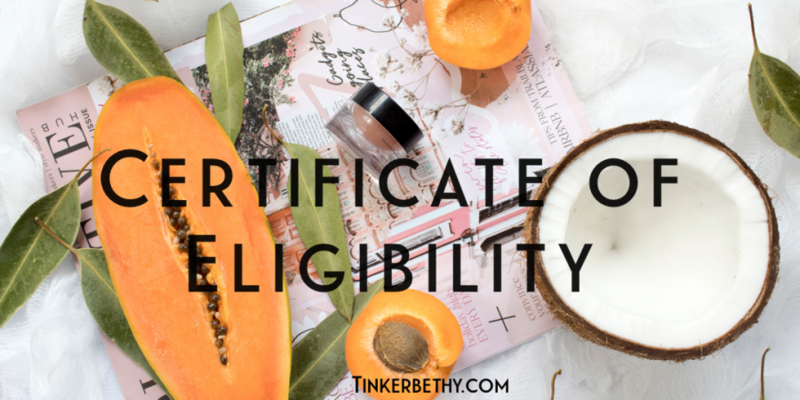 I truly appreciate your post about the application for the certificate of eligibility. It helped me in a way since I’ll soon be applying for it. I have a concernthough and I hope you can shed some light. Since my husband is back in Japan now, can I send my COE application form to him and he will take care of the rest? I’m looking forward to hearing from you.. Thank you. Thanks Beth for that piece of advice! Will surely do it sooner.. ^^ God bless always! Next Post How To Get The CFO GCP Certificate?